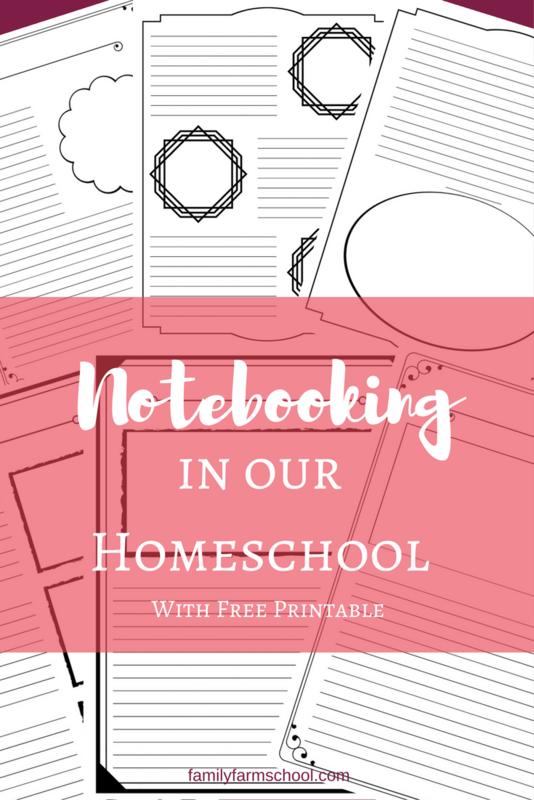 Today, I just wanted to write about notebooking, and what a life saver it has been for us in our homeschool! I was getting increasingly exasperated a couple of years ago with the direction our schooling was going with Bear. She was (and still is) an incredibly bright child…in fact, that was actually why we didn’t send her to public school in the first place. She was reading independently before she was five. I wish I could take credit for that, but I can’t…all I did was teach her the basic sounds, she took off from there faster than our phonics program could keep up! But I digress. As is often the case with bright children, she had trouble sometimes applying herself to what I was trying to teach her. When she was younger, she loved doing workbooks…strange child, I know. So, I had kind of tried to encourage her by using workbooks early on. But, as she got past the point of learning the basics, her love for workbooks began to wane…but I was stuck in an educational rut. Plus, workbooks are so easy…as the teacher, I didn’t really even have to think about it. We’d just open our workbook, read our lesson, then I’d set Bear free to complete the independent portion of the lesson. But Bear hated it. She didn’t jump up and yell, “YAY!” when I said “Time for lessons!” anymore. Instead I got a groan and “Right now? Couldn’t we do it later?” It had become drudgery. Even worse, Lizard was picking up on Bear’s attitude and adopting it as her own. Now I had to fight 2 kids every day to get started with school. Where had that little girl who looked forward to school time gone? I started looking at different curriculum options. I needed something that gave me a little structure, so that I could make sure we were covering everything. Bear needed something that allowed her to use that creative nature she was so blessed with. Enter notebooking. We can use it with pretty much any subject or curriculum we choose to use. We use it most in science and history, but I know some folks use notebooking for pretty much everything. Bear reads her assignment for the day. We have a discussion about it. The time our discussion takes really varies. We talk about any words or phrases that she didn’t understand, then I make sure they show up in her vocabulary work for the week! In history, in particular, we often discuss why it’s important to our lives today. Why do the things some dead guy did 400 years ago impact our lives after all that time? We don’t skip our discussion time. It’s critical for comprehension! Then, after we’ve discussed what she’s read, I hand her a notebooking sheet. Sometimes I give her a very specific assignment, but sometimes I leave the assignment very open-ended. She writes about what she’s learned, and illustrates it in some way. It’s that simple. It’s always interesting to see what part of each lesson has really resonated with her each day, too. She loves that she gets to draw during history, and she really takes pride in her work (both the writing and the drawing). I love that she’s actually learning her history! It’s a win-win for us both. Plus, at the end of every year, we’ll always have something to come back to…a record that reminds us both of what she’s done in the past. Here’s a free printable for your personal use. There are 12 different general use notebooking pages in this free pack. You can use them for any subject you want. All I ask is that you don’t sell them, or share them. If you want to share them with someone, send them here to this post to get their copy! Thanks! As an English instructor, writer, and homeschool momma, I can tell you that you are doing your child a world of good by letting her write down what she has learned, etc. Her writing skills and note taking skills, as well as critical thinking skills (because you talk about the readings), will be so good. So many kids come to college with below average writing skills. So keep up the great work. My son loves to write and draw about what he learns too, or summarize the lesson, or answer a question on the lesson, etc. He is taking a science class at a private school and he was the only kid taking notes from day one. The teacher had to teach the other middle schoolers to take notes. In fact without me even telling him, he was reading the science chapters and then summarizing them in his own words after he read the chapter. Keep this up. It will pay off many times over. We love notebooking as well, and I’ve discovered that my kids are good notetakers without prompting as they get older because we’ve done so much notebooking and recording what we’re learning throughout the years.